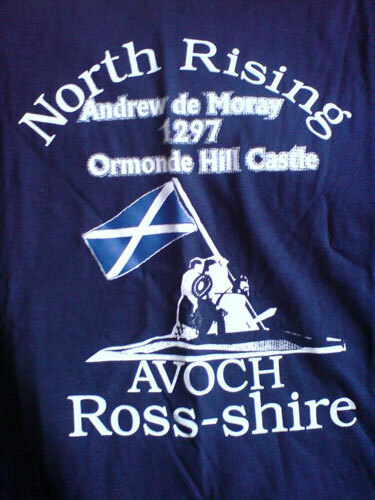 On the 3rd Saturday in May the annual North Rising commemoration takes place at Avoch (pronounced Auch) to celebrate the raising of the standard by Andrew de Moray at the Castle of Avoch (Ormond Castle). This standard was raised in 1297 as the focal point of armed revolt by those patriots of Northern Scotland against the occupation of Scotland by English forces under the command of Edward the 1st, Longshanks. 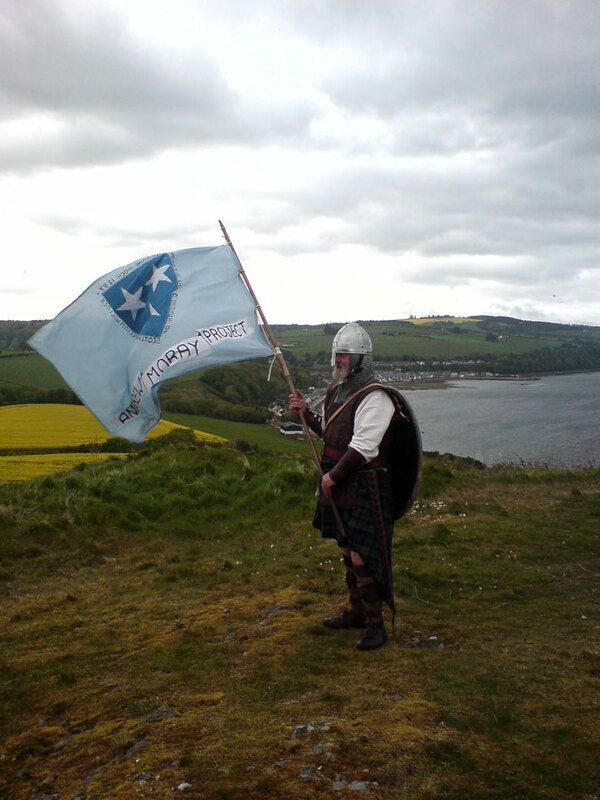 On Saturday the 16th of May members of Crann Tara joined with fellow patriots from Siol nan Gaidheal, The Society of William Wallace and members of the local community, young and old, from far and wide, to celebrate this momentous event in the history of Scotland. An event which has been celebrated for many years with Wendy Wood a more famous attendee in 1980, its history is one of dedication by the people of this part of Scotland to ensure that the spirit of Andrew de Moray and those who rose to that standard will never be extinguished. With the day breezy but dry, meeting at the football park in Avoch allowed for fraternal greetings and a fine display of arms by Patriots in battle dress of the period including an excellent display of the De Moray coat of arms. New members present were Alan Henderson and his wife who were attending their first event and had travelled from Central Scotland. Rob Gibson, the local SNP MSP greeted those in attendance with a short welcome speech and the march set off led by Project Member, Charlie Beattie in fine period dress. 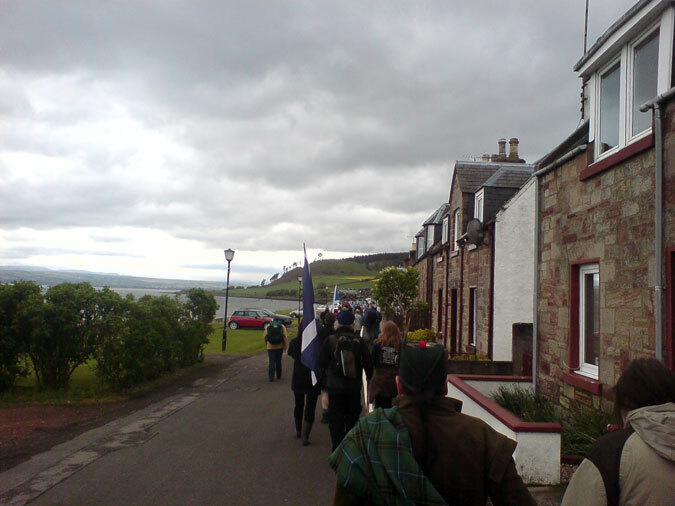 A brisk pace was set as the march with flags and banners flying in the stiff breeze set off along the Main Street then down onto the shore road and up the country road leading to Ormond Castle perched high on the hill overlooking the small Moray Firth town. Some of the attendees in traditional battle dress. On reaching the site of Ormond Castle you are greeted with a fine defensive location possibly on the site of early fortification, though not much is left having fallen victim to Cromwell’s English in the 1650’s. The castle was reputed to be one of the finest in Northern Scotland at that time and home to the de Moravia family who ruled over vast tracts of land in Moray in the 13th century. The de Moravias were decedents of Flemish Knights, part of David the 1st’s Norman settlement of Northern Scotland and they quickly became established marrying into the ancient Thanedom of Moray. 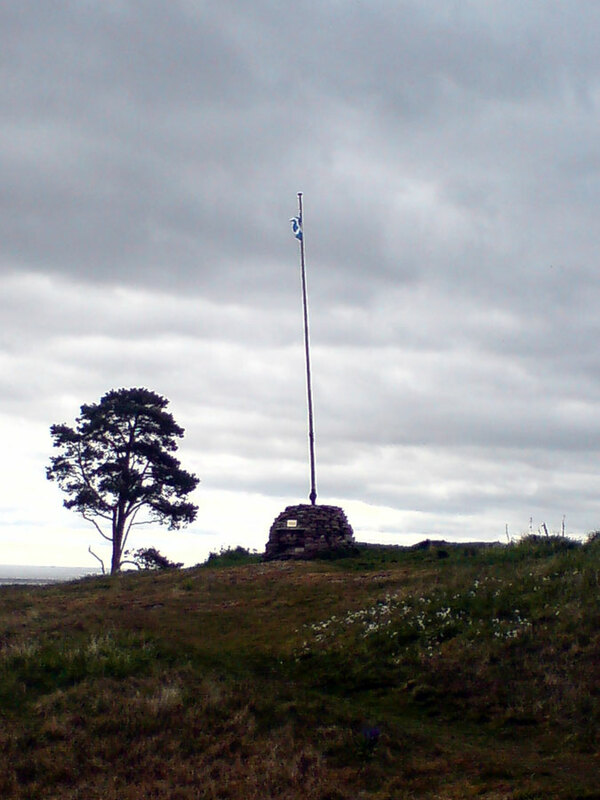 A cairn with flagpole was dedicated here on the 700th anniversary of the standard raising in 1997. This replaced an earlier stone that was used in earlier commemorations with the remnants of that stone set into the new cairn. Marching along by the shore. 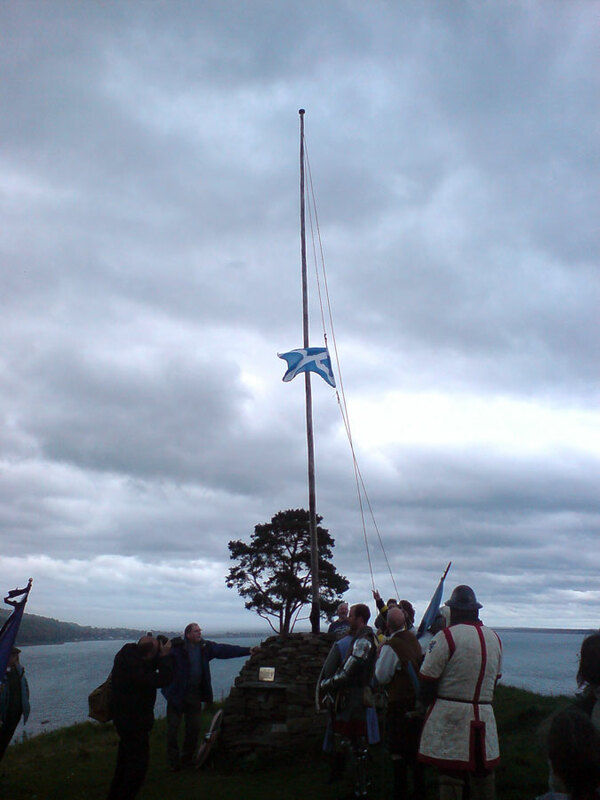 Each year the Society of William Wallace has presented the new Saltire, Flag of Scotland, to the Andrew De Moray Project in recognition of the close bonds between Andrew De Moray and William Wallace. 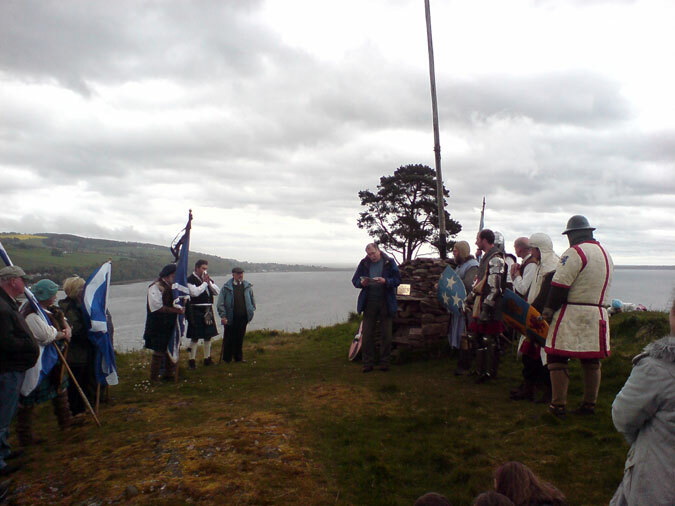 On gathering at the cairn, the symbolic lowering of the old flag and presentation of the new flag by Duncan Fenton of the SOWW took place, and the new standard was raised to much applause - a tremendously symbolic occasion given the location and what has gone before. Rob Gibson then made a fine speech with reference to proposals for the coming year. This outlined efforts to get Historic Scotland to allow the upgrading of the site with the possibility of a statue of Andrew Moray to be considered, along with access upgrades and interpretation panels. This of course may mean archaeological digs and interest in these has been sent to Channel 4’s Time Team pending responses? With people like Rob and his committee these efforts will surely not go unrewarded. 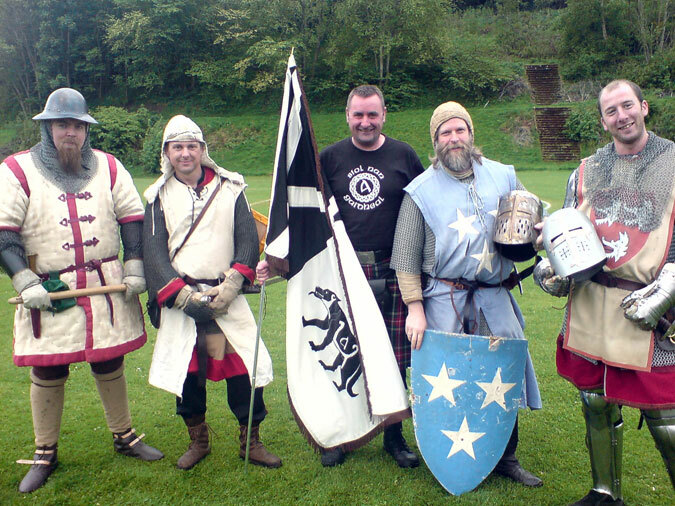 Duncan Fenton of the Society of William Wallace was invited to say a few words and reiterated the strong bonds between the two groups. Following the closing of the commemoration, members were treated to an excellent history of the cairn given by Charlie Beattie including its building which rounded off a superb afternoon in the excellent setting of the Eileen Dubh. Highland Hospitality was at its best in Charlie’s house on the shore road, ending a day never to be forgotten. 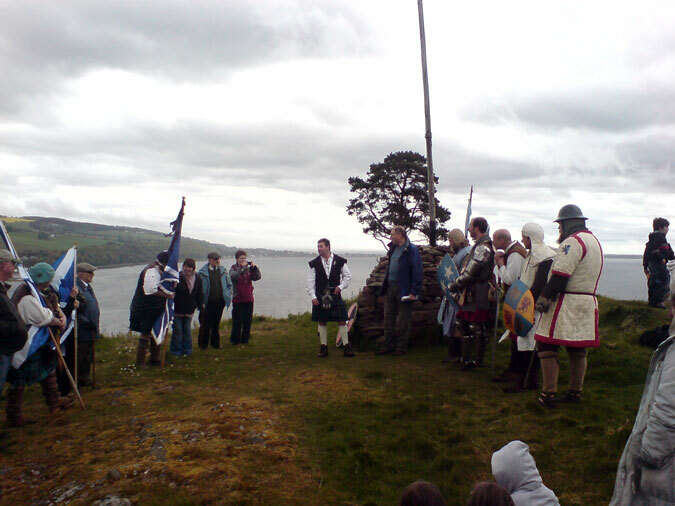 This commemoration is probably not as spoken about as some, but the significance of the events of 1297 and its place in Scotland’s proud history are in good hands; and displays of Patriotic Unity can only strengthen our cause as we renew our fight to once again rid ourselves of the yoke of foreign policies alien to our land. Duncan Fenton addresses the crowd. Rob Gibson says a few words.